LSS and its affiliated entities own and operate 17 communities in Missouri and Illinois. Through their system, they provide independent living, affordable housing, assisted living, assisted living memory care, skilled nursing care centers, skilled memory care, and short stay rehabilitation services. LSS sought a partner that would facilitate the underwriting of their Mason Pointe expansion project and other planned capital improvements. The objectives of LSS were to provide minimize overall interest expense and debt while attaining level debt service and preserving a portion of anticipated initial entrance fee inflows to facilitate later repayment of higher rate debt. The entrance fee bonds were structured as 15 year term bonds with a mandatory put in 3 years if they were not fully defeased with initial entrance fees from the Mason Pointe project sooner. Minimized interest expense by freeing up cash flow to allow LSS to currently repay, with cash, certain higher rate bonds and preserving portion of anticipated initial entrance fee inflows from the Mason Pointe project for use to currently repay bonds in the future. Structure also included call provisions taking into account the elimination of advance refundings. HJ Sims priced the BBB rated fixed rate bonds with yields ranging from 2.90% to 4.35% for bonds having maturities ranging from 2022 to 2042. Bonds were widely distributed adding diversity to the LSS investor base. Lutheran Senior Services (“LSS”) is a non-profit parent company that, together with its subordinate entities, owns and operates the following 17 communities in Illinois and Missouri, all of which are managed by LSS: Breeze Park, Concordia Village, Dunn Road Manor, Halls Ferry Manor, Heisinger Bluffs, Hilltop Manor, Laclede Groves, Lenoir Woods, Lutheran Hillside Village, Mackenzie Place, Meramec Bluffs, Mason Pointe, Meridian Village, Richmond Terrace, Rose Hill House, St. Joseph Bluffs and Westfield Manor. Through their system, they provide independent living, affordable housing, assisted living, assisted living memory care, skilled nursing care centers, skilled memory care, and short stay rehabilitation services. HJ Sims was engaged by LSS to underwrite the financing of an expansion to the Mason Pointe community as well as additional planned capital improvements at other communities in the LSS network. As part of its initial review Sims identified certain existing outstanding bonds that were bearing interest above current market rates and a strategy to repay those bonds on a current basis to reduce the overall interest cost to LSS. 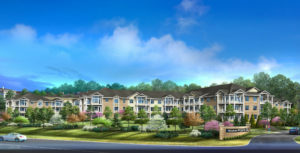 Sims and LSS worked closely together to devise a plan of finance that would have a relatively short maximum term (23 years) while providing a level debt service platform and maximizing the application of anticipated future initial entrance fee inflows from the Mason Pointe project to repay higher-rate bonds. Furthermore, the existing master trust indenture preceded the advent of entrance fee principal redemption bonds; thus the entrance fee principal redemption bonds needed to be structured as long-term balloon indebtedness with redemptions from entrance fees and a mandatory call within 3 years if they had not fully been paid with entrance fees at that time. In order to meet the strategic financing objectives of LSS, the structure proposed by HJ Sims included utilizing a smaller portion of the entrance fee pool to repay bonds allowing LSS to take advantage of relatively historically low interest rates for their longer-term debt, call provisions that took into account the impact of the elimination of advanced refunding bonds, and a longer term entrance fee bond that was callable if not fully repaid within 3 years to accommodate nuances of the existing LSS master trust indenture. Execution on the structure also required facilitating the ratings confirmation process with Fitch. On January 25, 2019, Sims successfully priced and subsequently closed on February 25, 2019, the aggregate $92,370,000 Fitch BBB rated fixed-rate bond financing. The LSS bonds were widely distributed, and the implemented financing structure allows LSS to achieve its objectives of minimizing overall interest expense while preserve a portion of projected initial entrance fee inflows to repay interest rate indebtedness in the future. For more information on how Lutheran Senior Services was Financed Right® by HJ Sims, please contact Aaron Rulnick at (301) 424-9135 | arulnick@nullhjsims.com, Melissa Messina at (203) 419-9015 | mmessina@nullhjsims.com or Patrick Mallen at (203) 418-9009 | pmallen@nullhjsims.com.